As he prepares for his fifth and likely final Olympic Games, U.S. skier Bode Miller wonders whether anyone will ever understand him. BEAVER CREEK, Colo. -- With more than two hours before another race in possibly his final World Cup season, Bode Miller sits at a table in a Beaver Creek lodge and waits. He's already blown through his inspection on the Birds of Prey course. Now there is one job left before he throws himself down the mountain when it actually counts: relax. At 10,200 feet, the view through the oversized windows at the Spruce Saddle Lodge is straight out of a winter postcard. Endless rows of massive, snow-covered pines. Pristine, untouched powder as far as the eye can see. The cafeteria here serves more than burgers and pizza. There's sushi, pho and lobster tacos. Somewhere in the fog down below, reality exists. You just can't see it from up here. At some point soon, the other 76 competitors in the field will finish their inspections and trickle in to begin their own game of hurry up and wait. Seventy-five of them will be younger than Miller, who is 36. But for now, he is alone. He can sit anywhere he wants. So of course he picks a chair with his back to the majestic view. Published on Dec 23, 2013Brash, talented and durable Bode Miller has left a memorable impression with every Olympics he's competed in. We expect Sochi, will be one more "buzzworthy" opportunity for him to shine. Bode and Kyla: I'm just learning about your grant to Vermont Adaptive Ski & Sports, and just wanted to say thanks. We're one of the families that is benefitting hugely from that program. Our son Jesse has Down syndrome and is not a "natural" athlete; through this program and the incredibly encouraging coaches that serve it, he has gained enormous confidence, and the day last winter he skied downhill under his own power—no tethers, no wedges—was a pretty emotional day for us. These programs really are life-changing. Thanks so much for your vision in making them happen. Kelly Whiteside, USA TODAY Sports 1:43 p.m. EDT October 18, 2013 FRANCONIA, N.H. – The Bode Miller the world rarely gets to see is sitting in the room where he was born. The family room might look different from its late '70s decor, but the scenery hasn't changed. The 450 acres of rolling fields, streams and woodland his family has lived on for the last 70 years looks as beautiful as ever. As Miller, 36, heads into the twilight of his ski racing career, and likely his fifth and final Olympics, he's convinced many see him as "over the hill or washed up." Miller says this, by pure happenstance, while in the room where it all began. The World Cup opener in Soelden, Austria, on Oct.27 will be Miller's first race in 20 months after missing last season due to microfracture surgery on his left knee. Still, his goals are huge, skeptics be damned. "I think I could absolutely go out and crush this year," says the most successful U.S. Olympic male alpine skier of all time. "I can have the best season I've ever had. There's no question about that. My body is still very capable of it, and my mind is in a much better place than it's ever been before in terms of the right harmony in my life with my wife and my kids, my family and the foundation (his Turtle Ridge Foundation supports adaptive and youth sports programs)." Last October, Miller married pro beach volleyball player Morgan Beck, 26, after a whirlwind courtship. Beck, 26, had previously been married and was in no rush to date again, and certainly not someone portrayed as a party boy in ski boots. Plus Beck had first-hand knowledge. In 2002, Beck, then 14, attended the Winter Olympics in Salt Lake City (where Miller won two silver medals) with her family. Late one night she was interrupted while doing her English homework. "All I hear is music, people screaming and sure enough it's all of Bode's buddies. He has the condo next to us," she said. "My parents checked it out, came back and said, 'Oh, that Bode Miller!" Ten years later, Miller and Beck, who are represented by the same agent, met for the first time. In Beck's case, reluctantly. She was playing in a tournament in Fort Lauderdale when Miller called and asked her out to dinner. The next night, he called and asked to meet up for drinks. "Well, I'm going to come to your tournament tomorrow." "Please don't come. I don't want you there. I don't want any distractions." Miller showed up anyway and cheered enthusiastically throughout. "I thought, 'Who is this guy? He needs to go away.'" After the last match, Beck saw Miller walking toward her. "Oh my gosh, he needs to just disappear," she said. She tried to walk away. Miller persisted. "I don't want to freak you out, but we're soul mates," Miller told her. "At that point, I'm thinking this guy is absolutely crazy," she said. Within a month and a half of meeting, Miller bought an engagement ring. So did she have a hard time convincing her parents that Miller wasn't just that rabble rouser from the condo next door? "Yes! Yes!" her father Ed offers. "Here's a guy we didn't know a lot about but it appeared as if he had some baggage," Ed Beck says. "So we said, 'Just be careful.' We know she was smart enough to figure it out and strong enough to do what the hell she wanted to anyway." So what does Ed Beck think of his son-in-law now? "He's one of the nicest guys I've met, very thoughtful." What the Millers have endured in their first year of marriage is "more than what people go through in 20 years," Morgan Miller says. In January, she suffered a miscarriage. In February, a former girlfriend gave birth to a son fathered by Miller and a court battle for custody ensued. (Bode Miller also has a 5-year-old daughter from a previous relationship.) In April, his brother, Chelone, 29, died of an apparent seizure thought to be related to the traumatic brain injury he sustained in a motorcycle accident in 2005. Chelone Miller was hoping to make his first Olympic team in Sochi, Russia. "This was probably his last realistic chance to do it," Bode Miller says from his family's northern New Hampshire home on a late summer afternoon. Assuming Bode Miller is headed to Sochi, perhaps he'll bring a bit of Chelone with him. Miller said he had "an unusual physical response" and perhaps absorbed what he calls a little bit of his brother's "life force. That energy definitely has parts of his identity in it." Miller found himself taking on some of his brother's traits. While playing golf, he started putting like his brother, not realizing it at first. "It was kind of cool in way because I felt like I had a piece of him to take forever," Miller says. In August at the sixth annual BodeBash Golf and Tennis Classic, a fundraiser for his foundation, memorabilia was auctioned to benefit a Chelone Miller memorial fund for aspiring athletes "who embody a dedicated and free spirited connection to their sport." In between tennis games at BodeBash, Miller's daughter, Dacey, sits in his lap eating ice cream. Dacey lives with her mother in California, but Miller sees her often, a main reason why he lives in a place completely opposite from where he grew up. His grandparents opened Tamarack Lodge in 1946 and 16 years later turned a few acres into a tennis camp. It's also where he grew up in the wood cabin his parents built (famously without electricity or running water). "This whole space is very family and its very sentimental and that's why Bode loves to come here," says his sister, Kayla, who runs the foundation. "That's why he comes home to do these events. It's different than anyplace else in the world." "My reaction was 'Oh my god. Really? Bode? Driving the 405?' I would have thought he'd be out of his element. But he's smiling and is happy as can be." The last day of September, Bode Miller attends a news conference with U.S. ski team officials. He's smiling. A few years ago, the scene would have been hard to imagine. A few highlights from the Bad Boy Bode era: In the lead-up to the 2006 Torino Olympics, he said in an interview he skied "wasted." Hyped to win as many as five gold medals in Torino, he came home empty-handed but "got to party and socialize at an Olympic level," he said at the time. Though Miller said his comments were misinterpreted, the damage was done. Following the 2007 World Cup season, unhappy with the way the U.S. Ski programs were run, Miller formed his own team. Now, he acknowledges he "influenced things in a negative way because of my attitude at times." But he's happy how the organization has changed in ensuing years. At the 2010 Vancouver Games, he won a gold, silver and a bronze. At that news conference almost three weeks ago, Miller partnered with the U.S. Olympic Committee to launch a Gateway to Gold program to help identify new Paralympic athletes. Miller sat next to his friend Cam Shaw-Doran, a former snowboarder who was paralyzed in a car accident in 1997. Shaw-Doran helps run Miller's foundation. All of this has led to what Miller calls harmony in his life. Whether it leads to a successful World Cup season and the Olympics soon will be known. Miller recently had a room full of World Cup trophies, which were stored in Europe, shipped to his California home. As he unpacked them, he began to get emotional. "It was very nostalgic to see a physical representation of the last 15-20 years of my work. "When you see it through the bulk of trophies ... it was impressive. I think I have 90 something podiums or something like that," he says, looking back at his life from the room where it all began. After more than 8 years being (loosely) based out of the Farm on Streeter Pond road, its time to move along! TRF will be relocating to s wonderful downtown location in Franconia at the Rivagale Building. Look for our new sign coming soon! This is exciting and motivating as well as a bit sad. Only a bit sad and only because we loved being at the so very much. Turtle Ridge Farm has been sold and renamed to the original Ski Hearth Farm and it has never been busier down there, as long as I can remember anyway! 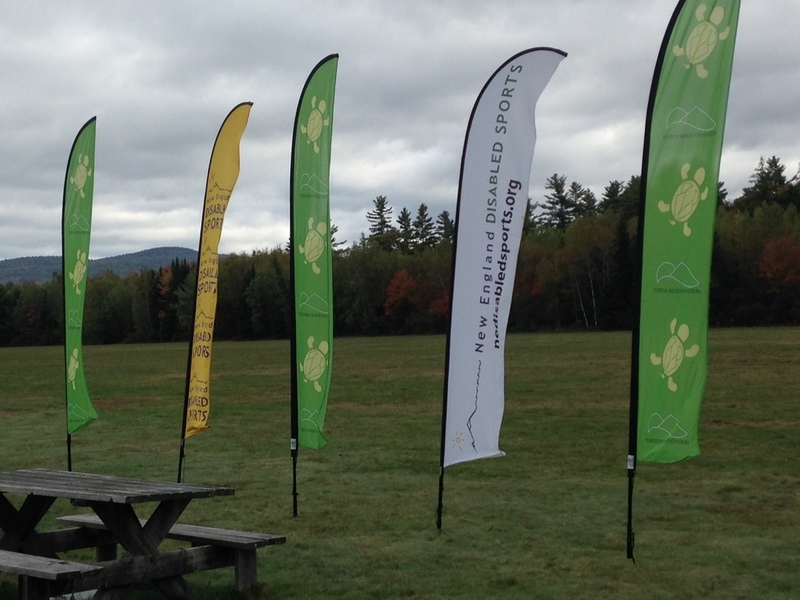 Turtle Ridge Foundation partners with New England Disabled Sports today to take a small group of our disabled friends up thousands of feet for some beautiful leaf-peeping a Franconia Glider Port! We hope to build interest in this unique opportunity and offer the experience annually!